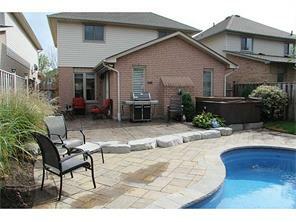 Stunning 3 bedrm detch home with 4 season salt water pool/spa & Hot Tub F/F basement wired for surround sound. Nicely finished on all levels. Fully landscape yard with concrete patio and awning. Double garage- Concrete Drive. Roof 2012, Bathroom update 2016. BBQ gas hook up. Great family home in desirable neighborhood.